I caught this movie on television the other night by accident. Well, maybe it wasn’t such an accident because I was clicking around looking for something to watch; which is always easier said than done. And, as often happens to me, I was hit with a black and white screen; bringing an instant halt to my clicking. Black and white really grabs me. 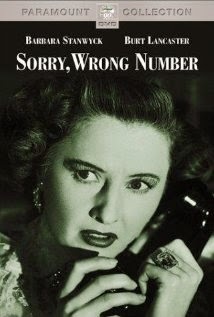 I was only 15 minutes into the 1948 film noir classic “Sorry, Wrong Number” with Barbara Stanwyk and Burt Lancaster. They play the ill-fated couple Henry and Leona Stevenson; she as the hypochondriac bed ridden wife, and he as the henpecked husband driven to despair by his wife’s imagined illness, as well as being a victim of his own demons. Henry Stevenson is a man with secrets. He lives sort of a double life; caring for his stricken wife; and also as a philandering and a thief. But all of his secrets come tumbling out one night when his wife; who is addicted to her phone, as it is her only link to the outside world; hears 2 men on the line plotting a murder. At first she tries to contact the police, but since there is no identity to the men she refers to there is little that they can do. During her attempts to trace the call and find the intended victim she becomes privy to her husband’s secret life; including his infidelity with Sally Hunt Lord; played by Ann Richards. She also learns that he has stolen some money and must make good or face some serious consequences. During the flashbacks, as she recounts her life with her husband, she realizes that there were many clues she chose to ignore. And when she finds out about the money she is ready to forgive him instantly; she really does love him. But by this time it’s too late to stop a series of events already in motion, set to happen at 11:15 PM. As the film closes; with Henry talking on the phone to a frantic Leona; all of the pieces fall neatly into place and leave you wondering how both of them could have been so stupid so as not to see the beauty in the lives they had; trading them for a guaranteed appointment with a hell of their own making. Outstanding performances by both Burt Lancaster and Barbara Stanwyck, and superb direction by Anatole Litvak, combined with a screenplay by the original author of the play, Lucille Fletcher, make this a classic you don’t want to overlook. Hi, Good review but consider revising the heading "Sorry, Wrong Number" with Barbara Stanwyck and Burt Reynolds (1948)" to Burt LANCASTER. You are correct in the body of the text but just not the heading. What a blunder! Thanks for catching it- and I'm correcting it right now... Robert at RT!